Did you ever think about the fact that almost all silverwear is silver? I mean I guess that is where the name came from, but it’s a simple item that has really never changed from its basic design. Yeah, there are some new handles and the spork, but the knife, spoon and fork are the same. (I’m talking the real deal here and not plastic). 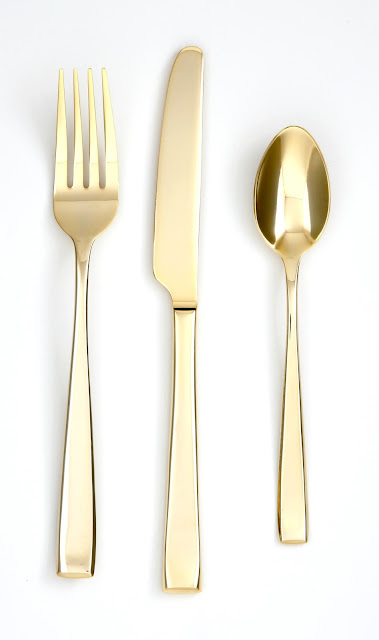 Well via the Sweet Thing Blog, I discovered GOLD silverwear, or rather in this case utensils! From Cambridge SilverSmiths, this goldwear comes in a fancy case - and they are currently on sale. 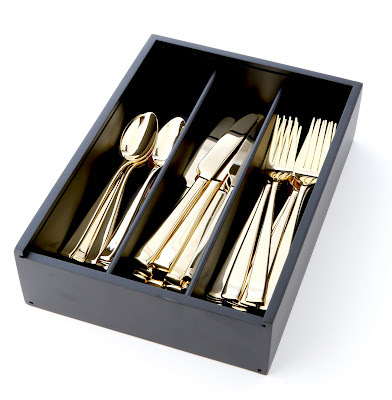 How festive would this be at your holiday table?